The Blue Bird BMS-105HV is a the highest torque servo in the very highly regarded Blue Bird BMS-105HV/106HV/107HV range of 10g servos. At 8.4V the BMS-105HV's torque is 5.3 kg.cm while still having an excellent speed of 0.09 seconds per 60° of movement. The Blue Bird BMS-105HV is a great HV servo built to the same space saving form factor as the MKS HV6100. It is similarly precise, with no free play in the geartrain, and it is even more powerful and faster than the competing product. The large output spline is identical to Futaba 25 tooth splines, so replacement output arms are readily available. Note the output spline is not the same as MKS so the servo cannot be used with most MKS accesories. Note this servo used to be called the Kawatomo CB-1005HV and some products (eg bearing servo frames) still refer to it under this old part ID. 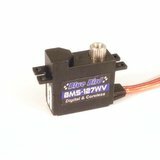 We're pleased you would like to review Blue Bird BMS-105HV Servo - 5.3Kg.cm 0.09s 10.9g 10mm. I have about a dozen of these excellent little servos. After a years solid use one of them in my Infinity F5J went wrong, jittering and failing to centre. I sent it back to Hyperflight and Neil provided me with a new replacement, with no quibbles. Fantastic service! Usare este servo para mis modelos F5J del 2019, los he visto funcionar a compañeros todo el 2018 y su resultafo ah sido excelente, ganando varias pruebas en España, asi que despues de testearlo en casa todo ok, muy buen peso y fuerza, tamaño excelente , para mi un 10.
centering failure and became completely useless in a few weeks. It seems that the potentiometers get ruined with time. Finally, I had to substitute all of them. I understand that most of the reviews posted here are very possitive, as the servos work perfect initially, but it would be nice if the same reviewers share their opinions again after several months of use. I have these BlueBird 105's in all my contest F5J sailplanes (Euphoria x2, Aspire x2) for Rudder/Elevator, and in 3 DLG's (for a total of 20)- plenty of torque, great centering and very smooth. In my opinion, every bit as good as that other 3-letter brand, at a substantial price difference. I have NEVER had an issue with these servos, and have just purchased a couple more for a new project. I tried switching over to the Blue Birds from MKS due to all the 5 star reviews. Had one servo out of 3 completely malfunction after first hour of use. Static noise is loud as well. I will be going back to MKS and using these blue birds for spoilers only. I bought 15 pieces of this servos for my F5J Explorers. One failed directly after delivery and Neil send me replacement. I thought it was bad luck but after few flights they started to fail one by one.. Definitely quality issue. I was lucky that I didn't crashed my expensive planes. I will make complain to Blue Bird directly. I have had 3 of these servos fail on flaps on a light F5J model. I have had 2 fail directly as supplied from the supplier before installation. There is clearly a quality control issue with these servos and I will be removing them from all of my models. I was going to use a pair of these for the tip s of a scale glider. After fitting them and hard wiring an extension lead 1 of the sevos had a fault where the output arm just went round and round.As I had modified the lead I could not get a refund, Neiloffered me a half price replacement. I declined a direct replacement and instead went for the MKS eqivalent.So not too impressed! I have purchased over 20 of these servos and ran them in a sunbird, longshot, ahi, and mini-vector and I fly pretty hard aerobatics and these servos failed in every single airframe. I pulled all the servos out of these airframes and sold my remaining stock. I was told initially that some glue got into the case but I was experiencing failures on elevator on my longshot dlg. My guess is the POTs are really inadequate and with HV they will burn out easily. Sometimes the servos would last only a few hard sessions. I was thinking these would be good substitute for the HV6100 but if you fly hard then they will not last long. No issues at all when I switch to the MKS HV6100. I originally ordered these for a Snipe DLG...so precise, so fast and so small! Loved it. It has since become my go-to servo for rudder/elevator in F5J/ALES competition planes. Absolutely love them. I have 8 of them in operation on my 4 contest ships and I've never had an issue. Have not installed servos into glider yet. Satisfactory test with servo tester. After a few days, the Bluebird BMS 105 hv. servo supplied. There was a servo that kept running around, but the servo cable was already removed by me, to make it easier to install in the wings so the guarantee was canceled and could not be exchanged. I received a 50% discount on a purchase of a new servo, which I did. Again after a few days this was delivered, which is an excellent service. I have not yet been able to test the servos in practice, but I am confident. In any case, the servos are fast and play free. I bought from you Blue Bird BMS-105HV Servo - 5.3Kg.cm 0.09s 10.9g 10mm.the servo problem. not holding point. He has a sailboat!I ask replacement! Great servo, purchased ten, waiting to use in models, although have used my jeti servo tester...testing shows good results at 6 volt and 7.2. I am happy with these Servos. They are very powerful, with good centering, no slop in the geartrain and no ugly noice! Use them all arround in an NAN Xperience Pro f3j. So far everthing is good. In use since two month, about 10h airtime. As allways great service and support from Neil!!! Very good servo, center's very well, very fast and working at 5 V also. The gear and the case are stronger than his opponent's, MKS 6100. A great alternative to the equivalent MKS, KST, ATLAS etc, at almost half the price. The servo is powerful with good centering, no slop in the geartrain and no noice!! Great servo for the price powerful, good centering, no slop in the geartrain. Quality of a higher price point servo I'm using them in my f3j and f5j models for rudder and elevator. So putting a lot of trust in them. A superb alternative to the equivalent MKS at almost half the price. We have eighteen of these in regular use with no issues. The usual excellent service from Hyperflight of course. This is an after use report. Two of the BMS-105HV servos I purchased and using for flaps have completely failed in flight and at the same time. They were being used at 6 volts. Not sure I will purchase again. These little servos are gems! I believe that in many ways they are superior to the Mks 6100 that they resemble so closely. Zero slop, superb resolution and entering with quite amazing power and speed. For less than £20 they are quite remarkable, we have a dozen of these in service and they all behave and sound the same! As a devotee of MKS 6100 servos I had to try these,but didn't expect too much. I bought four, they sound and before identically to each ,centre perfectly and are at the very least as fast and powerful as the originals. I will certainly buy more. Of course the service from hyperflight was as usual superb. good servo but better all Hyperfligth.co.uk and Neil for after market service! Excellent servos, very good centering and very good price!! A very nice servo that centre's well, is quick and not too expensive. Although not installed in a glider they perform just fine in my EDF Hawker Hunter. They are much better at returning to centre than some of my recent Hitec purchases. Recommended. At last! Excellent Micros at a reasonable price. All five servos are excellent! No play and exact centering. First rate service from Hyperflight.